Proper access to the renal collecting system presents the greatest challenge for the urologist performing percutaneous nephrolithotomy for large renal stones. 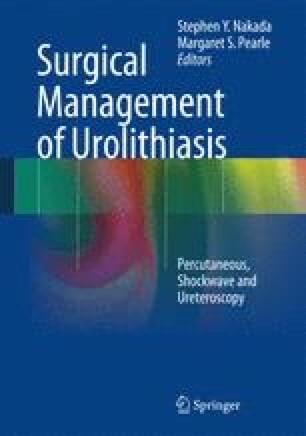 This chapter describes a technique for percutaneous renal access in which placement of a ureteral access sheath and ureteroscopy in the prone position provide direct visualization of percutaneous needle placement through the kidney. Nephrolithotomy tract dilation and sheath placement occur in a similar fashion to standard PCNL, but with the advantage of direct visualization. With this technique, precise renal access can be obtained with fewer renal punctures, optimized position of the access into a superior pole posterior calyx, decreased complication rates, and improved stone clearance.